This entry was posted in bug, wildlife and tagged wildlife on May 1, 2010 by Tammy. I tried an experiment the other day. I like my camera, but it doesn’t have a great zoom, so I thought “I wonder if I can take pictures through binoculars.” Obviously I’m not going to carry binoculars around with me, but if I’m hiking or something I’m sure I’d have them. So…did it work?! Yes and no…it worked, but there is a circle around the picture. Personally, I kinda like it! 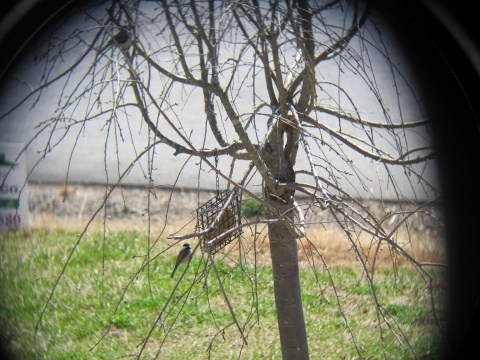 This entry was posted in bird feeder, wildlife and tagged Experiments on March 23, 2010 by Tammy. He came up to the feeder, but then the dogs started barking. He stayed still long enough for me to be able to get this picture. I wasn’t fast enough to get him at the actual feeder. This entry was posted in wildlife and tagged Home, wildlife on May 19, 2009 by Tammy.